Jose Mendoza Smith could be forgiven for being a bit surprised by the nature of his work at Simark. After all, the job title ‘Service Technician’ doesn’t typically evoke images of working in the kind of extreme, remote locations that require you to commute via helicopter. When Jose began working with Simark’s service team in 2013, he anticipated the kind of work environment he’d learned about during his two Bachelor of Science programs (Electrical Engineering Technology and Computer Engineering Technology). He expected he’d be in the service centre working on equipment. Initially, that’s what he got. Then, things changed. In 2014, Simark was acquired by SFC Energy, a global provider of fuel cell power solutions, and in turn added EFOY Pro Hybrid off-grid power solutions to their offering. 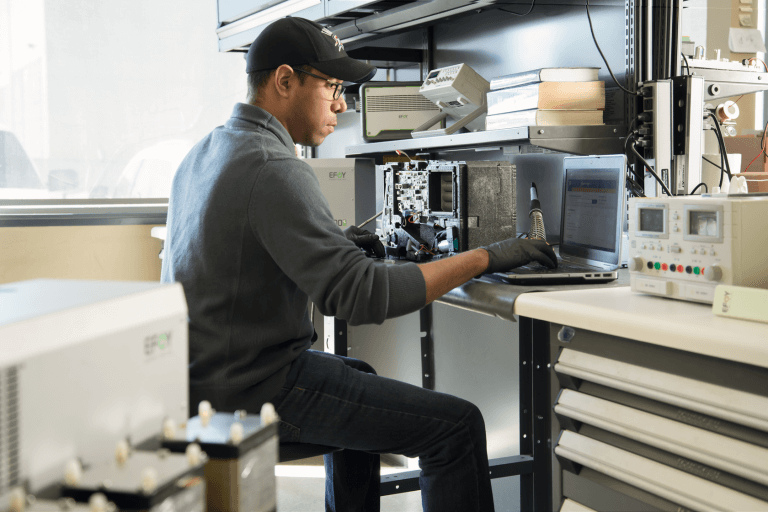 Jose trained with a US colleague for the next few months, learning the ins-and-outs of the EFOY Pro Hybrid solutions, which combine fuel cell technology with solar power to deliver an efficient and reliable off-grid power source. These days, Jose spends 30 to 50 percent of his time in the field, commissioning EFOY Pro Hybrid solutions in remote locations, often accessed by helicopter or ATV. His work has taken him to a communication tower on a glacier in northern B.C. where the EFOY is powering the only source of communication in the area. He’s waited out a two-week long storm at a work camp in Northern Quebec so that he could helicopter to a nearby hydro dam and install an EFOY ProCabinet system. Most recently, Jose has traveled to an open pit diamond mine in the Northwest Territories where the EFOY ProCabinet hybrid systems he’s installing are outfitted with special wind shields to protect the units against the extreme cold winter temperatures in the mine.